I wanted to thank everyone for help. I will keep everyone posted about the developments. Hopefully, this time I will really receive the refund and Comcast's records will really be updated to show that I'm no longer their customer. And I also hope that they find out what went wrong, so that other customers do not end up in the same situation. We have corrected this for Michal. We will make sure to credit everything back and expedite the refund. This should not have happened and on behalf of Comcast I apologize to Michal. We are still in the process of investigating what occurred, but it would appear that we did not schedule the disconnect to happen at the Customers location. This should have been picked up during any of the conversations this Customer had with us. Could it really be that the fact that I created this blog and that the blog was mentioned in a few places (most prominently The Consumerist) finally made Comcast solve my problem? Today Comcast reached to me three times to say that my cancellation was finally done and two of those times I even got an apology! At this time the cancellation has been processed and credits are being placed on the account. We will also work to expedite the refund. This is to inform you that our office has received your complaint, which was sent to our Senior Vice President, Rick Germano's office, regarding your account which was still being billed even after you have requested to disconnect back in May 2008. At Comcast, we strive to provide outstanding customer service and we welcome this opportunity to address your concerns. First of all, on behalf of Comcast, I would like to apologize for any inconvenience this may have caused to you with the delay in closing your account . I want to assure you that your account has been corrected and is now showing in closed status. I am currently working to get you your refund in the amount of $145.00 as soon as possible and mailed to XXXXXX, Palo Alto, CA 94303. I have already requested this to be expedited. I will personally follow up with you until you receive the refund check. In the meantime if you have any questions, please feel free to contact me via e-mail or you can call me @925-973-XXXX. My story has generated more than 10 comments there. More exposure can only help my case, so I'm really happy to be mentioned there. Colleagues have suggested a few other sites that may be good to contact. I may try them as I find more free time. I've looked around The Consumerist web site. It's pretty addictive (and depressing) to see how many people run into problems with big companies. The are a lot of stories about Comcast there! I sent email with my account number to that email address. Maybe this will help? I got so many promises from Comcast in the past that I don't know if I should be hopeful. I'll let everyone know how it worked out! But in the meantime if anyone has other ideas, let me know. Just in case. I have already tried: going to the local office (twice), calling (I don't remember how many times but it was multiple times), using the online chat. None of those mechanisms work. I would love to mail them a real letter because I've heard advice that this would give me better legal protection than phone calls or online chat. But guess what: Comcast's Conctact Us web page gives 6 ways to contact Comcast but none of them is a physical mailing address. The bill that they sent me doesn't include a mailing address than then one for mailing payments (there's also an address of the local office which I guess I could use to send a letter to). So, my guess is that Comcast also thinks that mail would give their customers a better legal standing and they intentionally do not provide it. My account number with Comcast is XXXXXXXXXX. On 5/29/2008 I visited the Comcast office at 1400 Terra Bella Ste D, Mountain View, CA 94043. I returned my equipment and requested to cancel all my services (I would be happy to email or fax a copy of that receipt of the equipment return). In the following months, Comcast has been billing me for services I no longer receive and for rental of equipment I no longer have. Whenever I receive a new monthly bill I am contacting the customer service. I was first calling Comcast and I visited the same office where I originally returned the equipment. More recently I have been using the online chat on the Comcast web site to have some kind of record of talking to your customer service. I used the chat on 7/25/2008 with Melinda (chat id 28370746), on 8/25/2008 with Brenda (chat id 29465037), on 9/23/2008 with Marco and on 9/25/2008 with Zhenaida. Both Melinda and Brenda acknowledged that this a problem with the Comcast records and they both said that they will make sure that I will stop receiving future bills and they both said that I would receive a refund of $142.29 in 4-6 weeks. Not only I haven't received any refund but I still keep getting bills from you. The most recent one arrived today and adds false charges for 9/23/2008-10/22/2008 to what it assumes I already owe. The other two analysts I talked to (Marco and Zhenaida) were not able to help me because "the program we use to access your account information is currently being upgraded to serve you better". addressing all "Ask Rick" messages. No response yet but I'm hopeful that Rick or his staff will be able to help me. This has been an absolutely horrible experience. 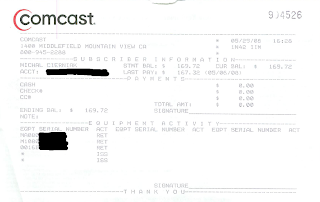 I canceled Comcast service on 5/29/2008 by going to a local Comcast office and returning their equipment. However every month since then, they have been sending me a new bill for another month of service. Each time I get a new bill, I contact their customer service and they say that there has been indeed a mistake and they claim that they will make sure that I will receive no more bills and that they will send me a refund in 2-6 weeks. This desperate blog post is my attempt of getting advice how this problem could be fixed. If anyone has any ideas, please either leave a comment at this blog or email me (cierniakmail-comcast at yahoo.com). 5/29/2008: I go to the Mountain View, CA office of Comcast to return my equipment and request that they stop my service immediately. Their staff takes the equipment, scans the barcodes, types something on their computer and hands me a receipt saying that I'm all set. 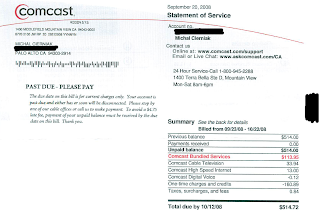 End of June 2008: I receive a new bill from Comcast that charges me for service from 6/23/2008 to 7/22/2008. I call their customer service and they say that they have no record of me returning the equipment and canceling the service. They tell me to go to the local office again. So I go to the Mountain View office again and show the receipt they gave me. They apologize, acknowledge that there has been a problem and spend 15 minutes doing something on their computer and say that everything is fixed now and I should receive my refund in 4-6 weeks. 7/25/2008: I receive a new bill from Comcast that in addition to what the June bill charged me for, adds charges for service from 7/23/2008 to 8/22/2008. This time, I try the online chat with Comcast. I get connected to Melinda (this chat id is 28370746). Melinda does some research and says that everything is fixed and "This $142.29 credit should arrive in about two weeks or less." 8/25/2008: I receive a new bill from Comcast that in addition to what the July bill charged me for, adds charges for service from 8/23/2008 to 9/22/2008. I try the online chat with Comcast again. I get connected to Brenda (this chat id is 29465037). Brenda looks into my problems and notices that something is weird. She says "My supervisor and a lead are helping me make the necessary changes to get this problem fixed for you tonight". This makes me feel a bit better and I wait patiently as they research my problem (it took them quite a long time). Eventually Brenda says "We were able make sure your account appears as cancelled as of May 26th" and "Your refund check will be 142.29, you should be expecting that within the next 4 to 6 weeks". On 9/23/2008 and 9/25/2008, I contact Comcast to confirm that everything is settles. Unfortunately their computer system is down and they can't help me. 9/27/2008: I receive a new bill from Comcast that in addition to what the August bill charged me for, adds charges for service from 9/23/2008 to 10/22/2008. I try the online chat with Comcast again. I get connected to Juan Paolo and ended up talking to the supervisor, Noel. Unfortunately, they were not able to help me since their computer system was down. Juan Paolo's advice was to ignore the bills and Noel's advice was to contact the Mountain View office. He told me to contact them soon but not right now because the computer system is down.